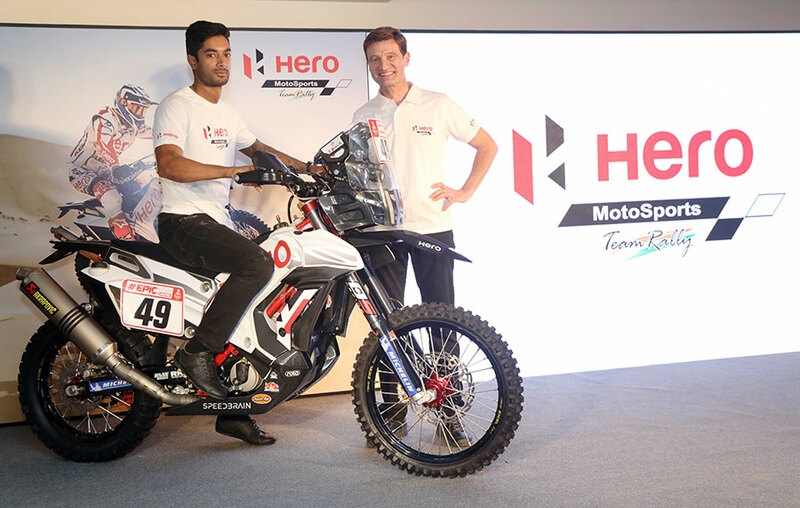 Hero MotoSports Team Rally, the motor-sport division of the world’s largest two-wheeler manufacturer, Hero MotoCorp Ltd., today showcased its new ‘Hero RR 450’ rally bike for the first-time in India. Hero MotoSports also announced its Team for the Dakar Rally 2018. Ahead of its second appearance at the world’s most grueling off-road rally, Hero MotoSports announced its Team for the Dakar Rally 2018. In addition to CS Santosh and Joaquim Rodrigues, the Team will field Spanish talent, Oriol Mena Valdearcos at the Dakar this year and expand its performance horizon. Inducted in the Team in September this year, Mena is part of Hero MotoSports’ vision to identify new talent and nurture them into professional rally riders. Mena will be making his debut at the Dakar. The new ‘Hero RR 450’ rally bike will also be making its debut at the Dakar this year. The new bike is an upgrade of the well-proven rally bike from last year, with new design and styling of tank, body parts and front section to improve mass centralization, handling and riding ergonomics. The new ‘Hero 450 RR’ proved its capabilities at the OiLibya Rally in Morocco this year. The key learning from the Team’s rookie year and last year’s Dakar experience have been implemented in the bike. There are several improvements in the bike, which have affected an increase in riders’ confidence. Hero MotoSports Team Rally had an impressive debut year with the distinction of being the only manufacturer team with 100% arrivals at the 2017 edition of the Dakar Rally. The Team also managed to register its maiden win at BAJA India and a podium finish at the Desert Storm. After making an impressive debut at Dakar 2017 with a stellar 12th place finish, the Team is now fully geared-up to exceed its previous performance at Dakar 2018. The biggest rally-raid in the world, Dakar, for its 40th edition will cross three countries, starting with Peru on January 6, 2018 and travelling through Bolivia before concluding in Argentina on January 20, 2018. This edition is expected to witness participation of 500 competitors from 60 countries who will cover a grueling stretch of almost 9,000 km. Out of the overall 14 stages, seven will include 100% dunes/off-piste, 1 marathon stage for all categories and 1 marathon stage for bikes and quads only.